In order to cater the diverse requirements of our customers, our company manufactures supplies and exports a wide range of Pneumatic Chisel. These products are available in standard specifications and can be customized if required. 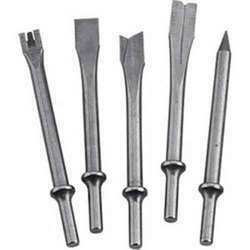 Moil and chisel point are supplied of good quality at competitive price. Peg Point, Moil Point & Chisel Point , Narrow Chisel for Pneumatic Breaker. Demolition Tools. Paving Breaker. Concrete Breaker. We are offering our customers an excellent quality range of Moil Points. These products are manufactured from qualitative range of raw materials, which is quality checked by our team of experienced professionals. We offer these Moil Points at most competitive prices. We are engaged in offering the quality range of Moil Point. Made in confirmation with the specific quality standards and as per the customers’ demands, these Moil Point are rapidly becoming the first choice of the customers. - 12" x 6" x 1¼". - 15" x 6" x 1¼". - 18" x 6" x 1¼". We are offering our client an excellent quality range of Moil Point. These products are made from very high quality raw material which ensures high durability at its user end. Different sizes and designs are easily available in the market. Moil Point(Pneumatic) Sizes:-12" , 15" , 18" , 24"
Moil point (Pneumatic) sizes:-(12×6, 15×6, 18×6). To meet the diversified requirements of our prestigious clients, we are engaged in offering Moil Points. Being a quality oriented organization, we are instrumental in presenting high quality array of Moil Point. This Moil Point is known for its sturdy construction, perfect finish and dimensional accuracy. Moreover, to get the total satisfaction of the customers, we provide this product at most feasible price. 11/4'' (32 mm) Hex. X 6'' (150mm) Shank X 12'', 18'', 24'' Long. 11/8'' (28 mm) Hex. X 6'' (150mm) Shank X 12'', 18'', 24'' Long. 1'' (25 mm) Hex. X 41/4'' (108mm) Shank X 12'', 18'', 24'', 30'' Long. Associated Pneumatic Industries Pvt. Ltd. 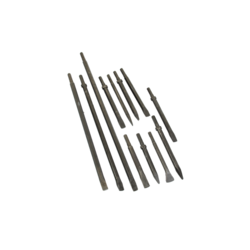 Attention to detail pays off at the tip of the tool A variety of moil points, narrow chisels, wide chisels, asphalt cutters another breaker steels in different lengths and shanks are available. These can be used with various paving breakers, pick hammers, and chipping hammers. Our accessories have met customer's specifications both in quality and value.